*If you don't already cook with your students, be sure to send home a note to parents asking about any food sensitivities or allergies to make sure everything is good! So, first, you have to go shopping! If you are able to take a field trip to a grocery store, now is a great time to do that! I love to use visual shopping lists so that students can better find what they are looking for independently. How will you cook? Do you have access to Stove? Microwave? At my school, I was able to use our culinary lab, so we had access to plenty of ovens and stovetops to make all of the recipes we wanted. However, I know many of you might not have the same access, and luckily, just about everything can also be made in a microwave these days! And hopefully everyone can find a crockpot, as I find it easiest to make a (precooked) turkey ham right in the crockpot. 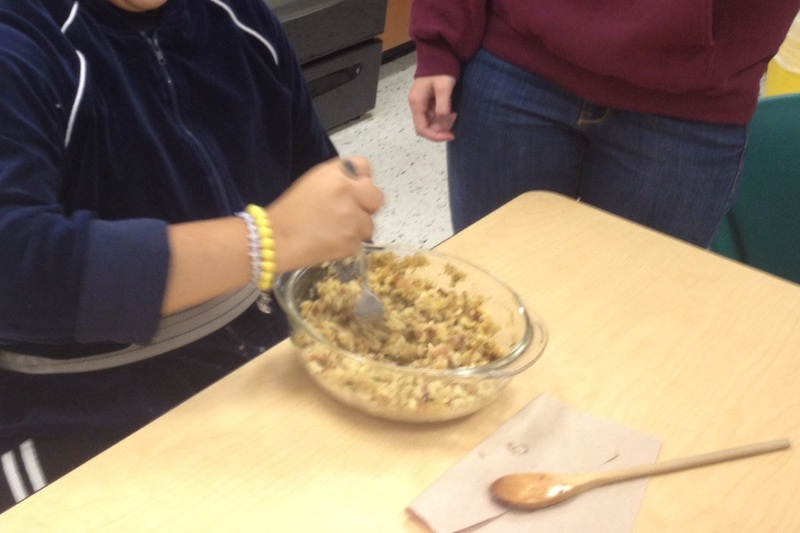 Depending on how much time you have, you might just want to have each student participate in cooking one recipe. You can group them together in groups of 2, or whatever makes sense for the amount of students and staff members you have. Depending on your facilities, you might also want to have students take turns going to your kitchen area and making their own recipe (especially if you only have one microwave, you don't want everyone to need it at the same time)! Everyone who isn't cooking can work on their normal academics, review their recipe, OR work on something Thanksgiving themed, like creating Thanksgiving cards for friends and family. Jamie shared on Facebook that she makes butter each year with her students, and it sounds so fun! "It’s really easy to make your own butter. 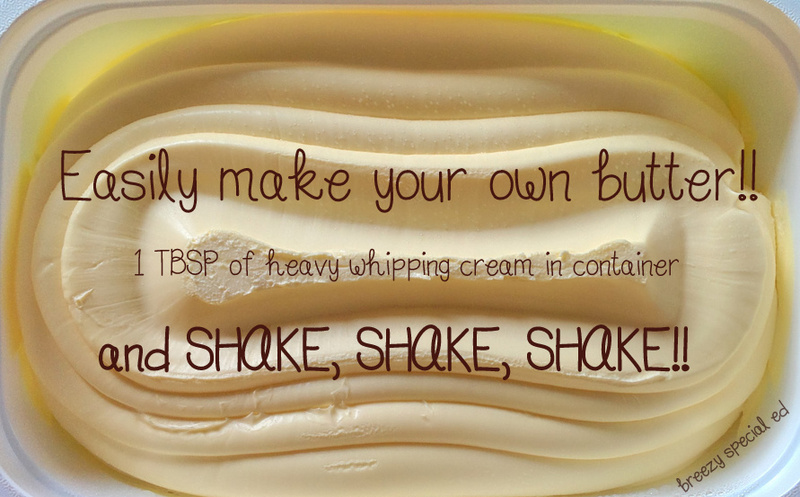 I put about a table spoon of heavy whipping cream in a small ziplock container and have the kids shake, shake, shake! Eventually it turns to whipped cream (you could add a little sugar at this point for desserts) and then you shake some more and it separates into butter and buttermilk (a little lump starts rolling around in there). Drain off the buttermilk (I save it to put in the mashed potatoes) and add a little salt and shake a little more. Now each kid has their own little pay of butter to put on their fresh baked bread. It’s a favorite activity every year. Just make sure to not put too much cream in the container or you will be shaking FOREVER!" 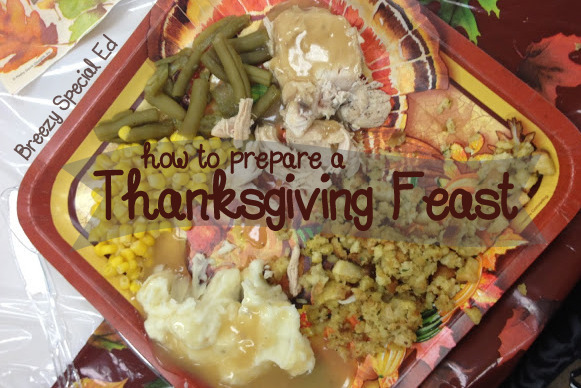 With a Thanksgiving Feast Review, like the one above or found in this Thanksgiving Recipe pack, you can encourage students to try at least a little bit of everything with an incentive if they get all 6 points. Plus, who knows, they might actually end up liking something and might be able to eat that at their family Thanksgiving too! I don't know if we had more fun cooking or eating! 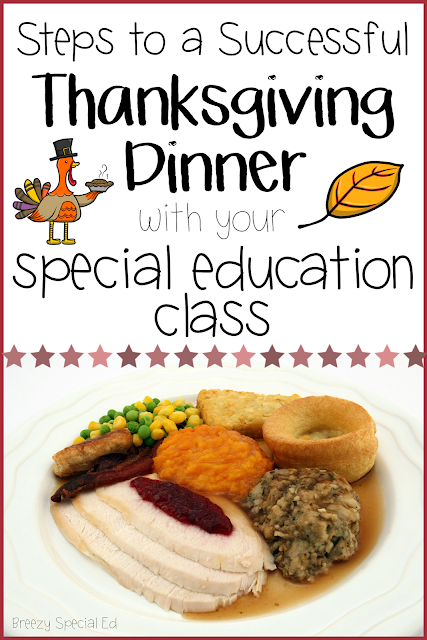 Will you make a Thanksgiving meal with your students this year? What's on your menu? If you'd like to use the resources featured in this blog post, you can find them here! Do you have the visual recipes available in your TPT store or anything? Yes, I was also looking for the visual recipes. Thank you!